The recent collision between an active American Iridium communications satellite and the inactive Russian Cosmos 2251 satellite illustrates that for as big as space is it isn’t big enough for satellites to roam freely in low Earth orbit without rules governing the use of “occupied” space. No one is disputing that this was a pure accident between an operational satellite and a defunct satellite that just happened to stumble upon each other, but the resulting impact between the two objects created a large debris field that carries with it the possibility of risk to manned vehicles including the International Space Station. While that risk is thought to be minimal the threat can’t be ruled out. The once endless void of space is becoming increasingly more crowded with satellites and debris of all shapes and sizes. In space, it isn’t just the size of the debris that is a concern, but the sheer volume. 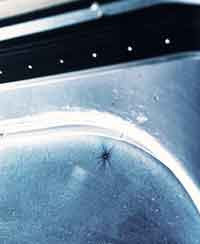 Large items (those greater than a few inches across) can be tracked and avoided; small objects traveling at high speeds are more difficult, but can be equally as damaging and can puncture the protective skin of the space station, break tiles on the shuttle’s protective thermal shield and even chip or crack the windshield on the shuttle. Such is the power of even the tiniest objects freely floating in space and moving at great speeds. 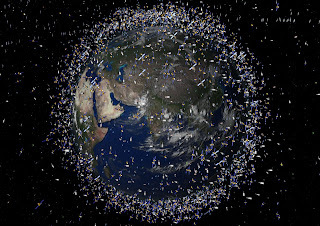 Currently, there are no rules for satellites operating in the relatively low confines of earth orbit and as seen by this incident the lack of coordination by civilian space interests with government agencies that track all orbiting objects can result in the creation of debris fields that could in a worst case scenario impact humans in space. The problem is one that will only grow as new space capable countries namely Iran and North Korea and private entities continue to emerge and fill low earth orbit with test and operational vehicles. These countries space vehicles lack the power and sophistication to maneuver once in orbit and the countries themselves lack the refinement of space operations to track the orbits of their objects related to the thousands of other objects inhabiting the same space. The fifty years of debris floating in space since the space age began isn’t a new problem, but is becoming a more visible problem due to exponential growth in the volume of objects that are hazards like those from anti-satellite tests conducted by China and the United States, the increase in spent boosters and obsolete satellites, the missing tools and hardware that have all collectively created a “minefield” in space for current and future manned and unmanned space operations. There are several things that need to be done all of which present challenges. Create a central launch clearinghouse for low-earth orbit objects. Something akin to filing a flight plan. Sounds simple but given that many U.S., Russian and Chinese satellites operate in this sector and have classified orbits would make disclosure problematic. That would prevent other countries like Iran and North Korea from cooperating using the same logic. It is necessary, but unlikely that the countries who need such a central clearinghouse would actually take advantage of it. Start now on a process to cleanup the mess in low-earth orbit. If we haven’t reached the point where it is a necessity we soon will. This is a technical challenge, but this is one that we can master and would make an ideal area of cooperation between today’s reigning space powers. It would be in their best interest to protect their current and future investments in space. A venture that would place small maneuverable robotic scavengers into low earth orbit that would sweep through large debris fields or that attach themselves to large pieces and de-orbit those pieces by plunging them into the atmosphere. These robotic “minesweepers” could clear the most hazardous and threatening debris from the paths of current or planned spacecraft. We can’t turn a blind eye to such threats or assume that rogue nations that develop a launch capability won’t subsequently use it as a terror weapon or a threat. For those reasons alone it is time to enact both a central space clearinghouse for low-earth orbital launches and a method to clear the most hazardous debris fields in space. The details of how the program can protect the rights of all nations while ensuring a safe and peaceful region in space are not insurmountable. The nations that refuse such a treaty or central command must be looked at as those that would harbor bringing weapons of terror to space. The world’s leading space powers cannot allow a new war on terror in space nor the ever increasing threat of debris to become a risk to national security or humans in space.